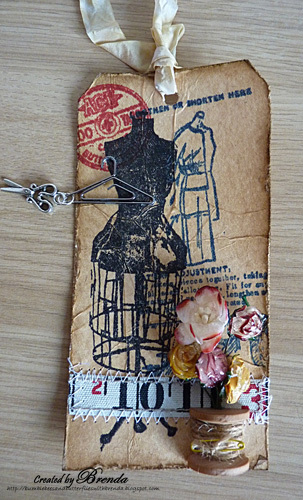 I told Trace at Inkypinkycraft that I needed to get a wiggle on and catch up with Tim's tags, so here is my latest one. More or less like the original which you can see HERE. I just love the faux porcelain flowers and the half wooden spool. I am looking forward to seeing your treasure with us this week, this is all about having some fun and hopefully meeting new people in our amazing blogging community. Link your 'treasure' post using the linky tool provided below and please include a back-link to here so that your visitors can come and join in too. To join the blog hop collect the code and place in your post to share with other people. 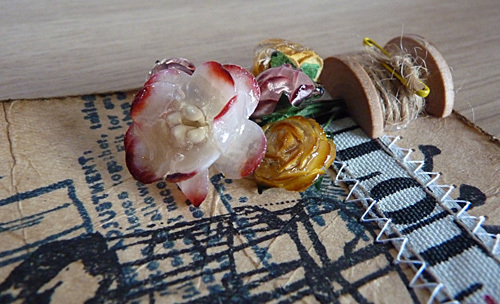 Oh, Your interpretation is wonderful Brenda; love the tiny scissors and the porcelain flowers in the half spool is superb ! The half spool is a stunning embellishment, I must remember this idea! So pretty and shabby, adore your tag. 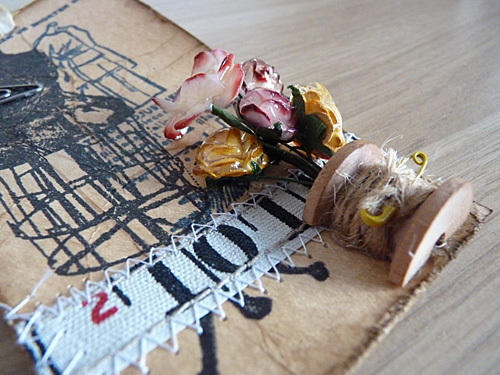 Ohhh'' I do love your Tags and this one is another stunner the flowers and spool are beautiful and so cute a very pretty make, hope your having a lovely day..
Looks great, just like Tim's. beautiful vintage tag, love all the details of it! A fantastic job Brenda with the Tim's tag. I must admit that was one of my faves and love the effect with the flowers. A delightful Tag,your elements are certainly in the oooh and ahhh category, as that is what came from my mouth when I viewed them, especially those scissors on the coat-hanger.....treasures indeed!!! Fantastic tag with great details. Loe the little sissor and the sewing. Okay, I always like what you make, but this one is extra special! PS--I'd love to join in Tuesday Treasures this week, IF I actually had the chance/motivation to make up something new! Just not gonna happen this week . . .
hi brenda..have left your details and link to tuesay treasures on my blog and tried to link up..but cannot for some reason? 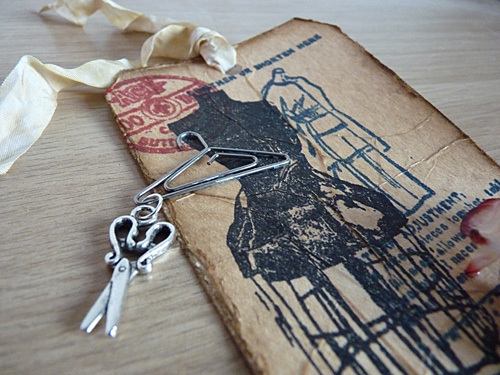 Hi Brenda, your tag is gorgeous, love the cotton reel and the scissors are brilliant. I have tried to link but it says that I have not back-linked. I mentioned your link in my post so do not know what to do next! Okay, I didn't make these tags this week, but you know, it's so nice of you to invite us to your party, and I hate to say no to such a sweet invitation . . .
Love how you potted those flowers! A fabulous tag!